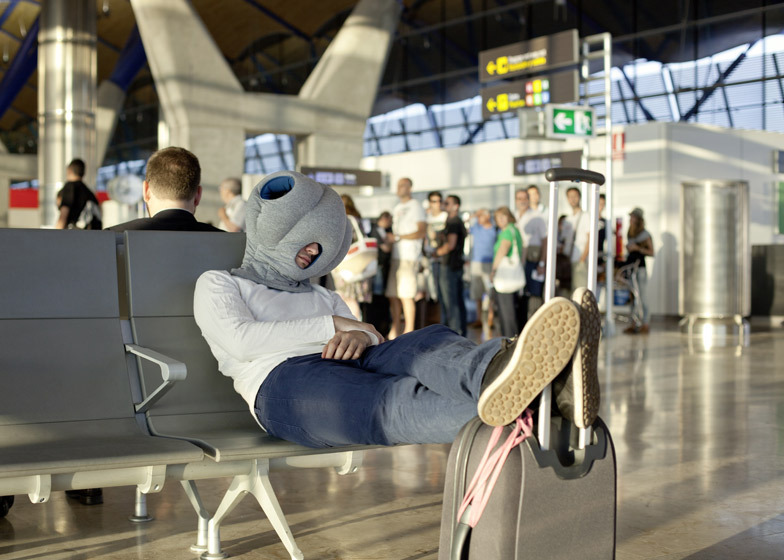 Product news: this squishy headgear by Spain and Switzerland-based studio Kawamura Ganjavian creates the perfect conditions for a power nap at your desk, at the airport or in the library (+ movie). The Ostrich Pillow's padded sides allow the wearer to take a warm and comfortable nap. The eyes and ears are covered while pockets provide a cosy space for hands when leaning on a desk. "Seeing as we all spend more and more time at work, in front of a computer screen or in transit, we thought why not create something that helps us nap, disconnect and dream?" explains designer Ali Ganjavian in the movie. The studio has attracted hundreds of backers so far on the crowd-funding website Kickstarter. Ganjavian and co-founder Key Portilla Kawamura are also founding members of the multidisciplinary creative platform Studio Banana. Other projects by Kawamura-Ganjavian we've featured on Dezeen include screens made of velcro-covered sticks and a padded reading room in a bookshop. Ostrich Pillow offers a micro-environment in which to take a warm and comfortable power nap at ease. It is neither a pillow nor cushion, bed or garment, but a bit of each, all at the same time. Its soothing cave-like interior shelters and isolates both your head and hands, perfect for a power nap. You can use the Ostrich Pillow at your desk, on a bench, on the train or while you wait at the airport to catch a flight. In fact, you can use the Ostrich Pillow whenever and wherever you feel like a nap is needed. The Ostrich Pillow's ergonomic design and comfort makes it both very easy to use and store. Designed to fit every head, it’s made from light materials that make it easy to take with you wherever you go. "We released our prototype online and discovered that everyone loves the Ostrich Pillow just as much as we do, so we decided to make Ostrich Pillow a reality. We chose Kickstarter – a funding platform for innovative designs to support our dream and produce our product. We designed the Ostrich Pillow with our users in mind and we wanted to use a platform where our fans can help build and share the dream with us."